Nearly two years ago, Bend's Tosch Roy was prepping for a ski mountaineering race in Bozeman, Mont. when inspiration hit. Using a bulky backpack littered with straps and buckles and other bits unnecessary for an uphill/downhill ski race seemed absurd, Roy said. He knew that at the top of the course he would have to remove his skis and scramble over rock and ice. Roy wanted a weight-conscious, no frills backpack that he could easily attach his skis to. Unable to find such a pack, Roy decided to make his own. "I had dabbled in sewing so I figured I'd give it a shot," Roy said. The young athlete hatched a plan, dropped out of Montana State University, and came home to draft designs and set up shop. Today, Roy, 23, is the owner and sole employee of Free Range Equipment, a backpack-making business based out of his dad's garage in west Bend. It's a decidedly low-tech enterprise—colorful PVC-coated pieces of nylon, spools of webbing and three industrial sewing machines take up most of the space inside the 20-foot by 15-foot space, which Roy calls "The Packtory." His cutting board is an old Ping-Pong table and dated ski and cycling posters litter the walls. But so far Roy's DIY business model seems to be working. Already, Sunnyside Sports, FootZone and Mountain Supply have picked up his minimalist backpacks. 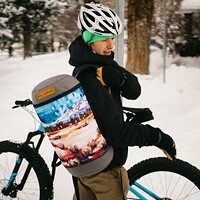 And the Summit High grad continues to take custom orders via his Facebook page, (facebook.com/freerangeequipment). Sunnyside Sports co-owner Mike Schindler was so impressed with Roy's signature 20-liter pack that he ordered one for all of his employees come Christmas. "They're just really light and simple," Schindler said. "Not a bunch of bells and whistles and stuff that can break. "I just used mine skiing and it was awesome." Called "The Stud," Roy's basic and most popular backpack isn't much more than a grocery-bag sized dry bag you wear on your back. It sports an easy-cinch draw cord top, a haul strap, two shoulder straps, and a minimal waist belt. That's it. The plastic-coated packs do, however, come in bright, bold colors. The Stud costs $100 while some of Roy's larger, expedition-style climbing packs approach the $350-range. Still, considering the fact that many soulless mass-produced backpacks fetch upward of $600, Roy's hand-sewn packs are a relative bargain. "After awhile I learned it's an awesome opportunity to learn how to grow a business," Roy said of his fledgling upstart. What Roy lacks in marketing and sales knowledge, he makes up for in passion and persistence. "I'm treating it mostly as a learning experience at this point." Part of that experience includes rigorous product testing, which Roy has on lock- down. He currently has friends field-testing his gear in locations as close to home as Smith Rock and as far flung as Patagonia. For his part, Roy is an expert rock climber, Nordic and backcountry skier, and cyclist, and pours all his cumulative years of outdoor experience into his efficiently designed backpacks. Roy comes from an accomplished family of outdoor athletes. His dad, Rob, is currently in Sochi coaching the Canadian Olympic snowboard team. His mom, Muffy, won the Pole Pedal Paddle twice—with nearly 10 years separating each victory. His sister, Zoe, is one of North America's top Nordic ski racers, regularly finishing inside the top 10 at national-level races. The outdoors are in Tosch Roy's blood. Business planning? Not as much. But the youngest of the Roys is figuring it out. While Roy remains busy, he's always stressing that next big order—one that represents valuable dollar signs for him and his young company. But he's not stressing his decision to drop out of school and open up a sweatshop of one. "I think I've learned more about myself and business than I ever did in school."